Why place Vehicles Ad in Mathrubhumi Newspaper ? Instant online hassle free booking of Vehicles ads at lowest Mathrubhumi Vehicle advertisement rates. No additional cost of classifieds in Vehicles for Mathrubhumi. Pay as shown in the advertisement rate Vehicles Mathrubhumi card. Multiple payment methods that helps users clear payments online or offline once the Vehicles newspaper ad is booked. 1988 model Pajero left hand drive 7 seater for sale, Pondy registration. Interested parties to contact 09830629298. Vehicle in good connection. Book your Vehicles ad now and Enjoy Discounted Mathrubhumi automotive advertising rates. 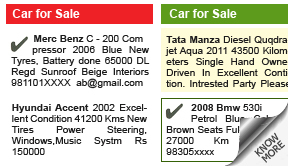 How To Book Vehicles Ad in Mathrubhumi Newspaper ? Now you can check the Mathrubhumi vehicles package rates of classified instantly online at releaseMyAd. 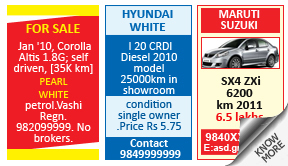 Choose your Automobile Mathrubhumi ad type. Select Mathrubhumi as your newspaper and specify your edition details. Once aware of rates of automotive ad in the Mathrubhumi proceed with your Vehicles online classified booking. Newspaper} Vehicle Advertisement Rate Card Now Online!